It’s so important to find time for yourself. When you find yourself craving time, does your brain feel scattered? Are you scrambling to figure out when you’ll fit something in? Taking time to yourself every day allows you to think about what you can do to make things easier on yourself and reflect back on your day but in certain seasons it can feel impossible. It’s a challenge to let ourselves slow down. There is always something that needs doing or tasks that seem to pile up, robbing us of our alone time. As women, when we’re alone we’ll reach for the phone, the TV remote, or even the vacuum cleaner. Sometimes we avoid ourselves because we’re afraid of what we might find: someone who is flawed and missing out on life’s party. When we give times alone to ourselves, we are more creative, we give more time to God, and we can see more clearly, allowing ourselves to work out problems in new and different ways, often eliminating tasks that take up a lot of time. Solitude is also a mini vacation for ourselves. We work hard at our jobs, raising our kids, and supporting our families. Alone time allows us to give ourselves a little hug and spend time in praise. In Craving Time we talk about the value of utilizing our Gap Moments well. It is one of my favorite tricks. There are quick ways to sneak in moments to yourself. Schedule ten extra minutes before appointments to arrive early, walk to work, take your lunch outside to a fun nook in the building, color in an adult coloring book while you wait in car-pool line or turn on some music while you’re making dinner and let voice mail answer the phone. Breathe deeply, be still and check in with yourself. Ask God to help you to quiet your soul. When you find yourself craving time, it’s often because you need a little time with yourself first. Find quiet moments throughout your day to check in with yourself. 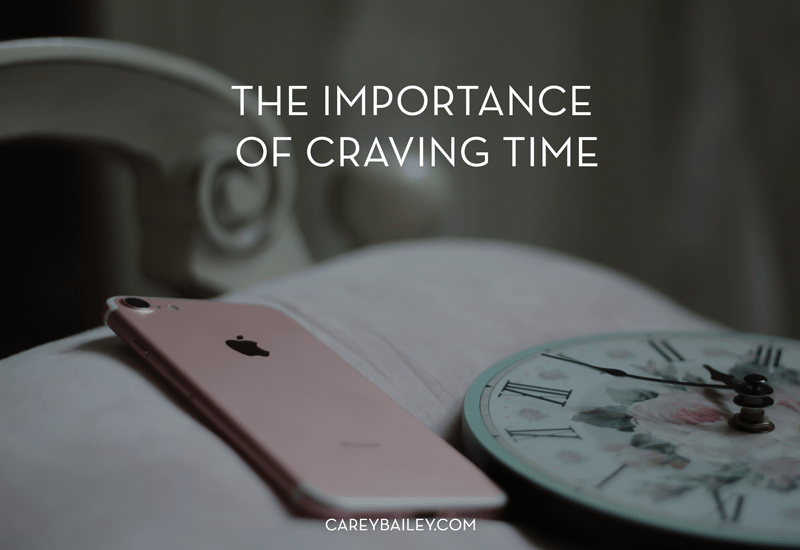 Dedicate a set amount of time each day (yes, it may mean getting up earlier) to reflect inward and focus your attention on your relationship with God and you’ll find the time you’re craving.